Yesterday wore me out, emotionally. I spent two hours with my son, taking care of errands. Those two hours felt like I'd been throw into a boxing cage, and I came home frazzled and on the verge of a total meltdown. B is in a very fragile state, with his sobriety. I can sense it, just like the weather is beginning to heat up to spring climates. This "D" guy, that took my son to a Thursday meeting... he's bad news. Very bad news. He shares the same name as his sponsor. That's the "D" I thought was calling me at home, asking for B. It's the same "D" who has been calling my cellphone (B lost his recently). It turns out that he's been the person selling my son weed. He's on my S**t List. I told my son that "D" has no business being anywhere near my house. I'm not happy that this guy even knows where I live, let alone my phone numbers. I don't want drug users/sellers in my life. I'm living with one, who is fighting for his sobriety. It appears that B owes the guy money. $30.00, he says. I drove B to meet this guy at Border's--a public place. B gave D the remainder of his cash. All of it. I am waiting outside the door. 15 minutes later, my cellphone rang and B grabbed it. He told D not to call my cellphone or house again. I was angry. Something feels very wrong. Very, very wrong. Things went downhill from there. B seemed stressed and anxious. There's something going on. I agreed to drop B off, for 1/2 hour to meet his sponsor. In the meantime, I paid $145.00 to pick up his diabetes prescriptions and suboxone refill. I got home later than I planned to, and that set me into a really foul mood. !#$!$#!@.... the dysfunction that follows with addiction is back in my house. My cellphone rang again. It was "D"'s number. He hung up when I answered. I called him back from a land line. "This is B's mom. I heard my son tell you not to call my numbers again. You know why my son is living with me. For that reason, I will not allow anyone to come near this house or to contact my son if I feel that they are going to jeopardize my son's rules to live here." "What did I do?" he asked, incredulously. "B told me everything. I know. Don't call here anymore, and leave my son alone." I told B what happened. "Can I call him, with you listening?". "Yep, go ahead". I hand him the phone. B dials and D answers. Things sounded heated. B kept saying "I'll talk to you face-to-face". B seems to be trying to calm D down and I can hear D shrieking. B keeps telling him that he's in serious trouble with me. He tells D that I'm freaked out and B wants no more to do with him. I'm going to lose it, I can tell, at this point. I tell B to hang up. Now. B continues to argue with D and I grab the phone. I tell D that he is harassing my son, and if he continues to do this, I will call the police. B freaks out and grabs the phone back. By now, my blood pressure is through the rough. S**t.
I recall who this D is now. He ran with B and his heroin using friend last year. I heard that D is bi-polar and not quite right. He's violent. He's vengeful. He barged into my ex-husband's house and confronted B over money, before. Even my ex couldn't calm him down. I asked B why in the world (well, HELL) did he reconnect with him?! "I thought he had changed", he replied. I'm thinking that he has not learned. This guy, obviously, has something B wants. Weed. "I regret it, mom. I want him out of my life." My son was a chatterbox, last night. He would not shut up. This is not a good sign. I asked him to pee and he readily agrees. I wait, outside the toilet door and he dips the tester into the urine. Thank God. Clean for opiates and cocaine. Positive for THC. B is back to chain smoking. These are not good signs. I tossed and turned, all night. I dreamed about finding drugs in the house. I overslept, this morning. I slept too late to go to church. Devil, get out of my joy! It's noon. B woke up at 9:30 and said he wanted to go to church. I handed his suboxone dose and talked to him. I told him that I am feeling we had a major setback, over the last three days. I told him that I am very concerned that he is holding back something from me. I tell him we have time to make the next service. "I'm not using, mom", he said. Yeah, heard that many times before. I leave the room. 15 minutes later, I could hear him snoring. He's still snoring. I think that I'll let him sleep. It's better, this way. He did his chores, yesterday. I told him to purge his car, completely of all paraphanalia. All of it. He's been procrastinating this. He showed me all the foils, with that ugly black stripe of heroin. I have come to loathe the sight of it. He founds some straws. We got rid of it. The car sits in our driveway. We've insured it only in case it's vandalized or stolen. I hope this isn't going to happen...but this D guy worries me. B doesn't have car insurance. He hopes to save money to buy car insurance. If he quits blowing money, and knows that buying weed--- or any drugs-- will end his living here, he can do this in a couple of months. We worked on a budget, and he sees that after paying rent and savings, he should have an extra $100 a week. If he learns to be careful, he can save for insurance. The boy can't save money. I have a long way before I can hope to show him what sacrificing and patience (he has none of those traits, yet) can do. He cleaned out his closet and showed me books and magazines, where he stashed foils. They are now gone. 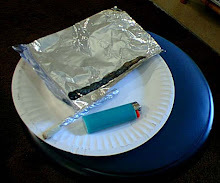 He emptied his duffel bag, and found more foils. These are all from before January, when he was lying about his sobriety. Poison. Disgusting poison. I hate the sight of heroin. Today, he has to shampoo his bedroom carpet. I told him that if I find any black residue...any more of the foils, it's over. If I find any positive traces of any drugs in his test, he's gone. Telling my husband about this, while B is sleeping, made me choke up. "Do you know what my greatest fear is? ", I asked my husband. "That B will relapse again?" he replied. "Worse. That he will relapse and I will have to throw my son out of my life for one year. I cannot fathom the pain that will bring me". Dear God. The devil is attacking this house with all that he has. My son has one foot in your Holy world and one foot in the devil's snare. My son knows you, Father. My son clearly knows the difference between right and wrong. But the devil is fooling him. The devil is playing with him. The devil is tempting my son. I pray that you will sever ties to D and anyone else who is trying to lure my son back into using drugs. I pray, Heavenly Father, that you will deafen the lies of discouragement that the devil is whispering into B's ears. I pray that you, God, will fill my son's thoughts with your loving and encouraging thoughts. Help me, Father, to be a Godly mother. Help me, Father, to show my son that he is making progress and that you are pleased. Thank you Father, that my son and I are able to talk. I pray that I will help lead my son down the path you have set before us. I want to follow you, Lord. I pray that my son will follow along with me. Thank you, to those of you have emailed me privately and those of you who are posting comments on my blog. They make me cry, make me smile-- but each of them reaches me like a warm and caring hug. Thank you. My son is sleeping, as is my husband. I love this time of the morning-- the peace, the quiet, and the large windows where I am sitting and enjoying the morning spring sun that is showcasing all the spring blossoms. From my point of view (mom), I have had a reality check-- my son is at a very fragile state, in his sobriety. I do believe that he really wants to stay sober... and I do believe that he is not using opiates. I can say this, because his doctor drug tested him on Thursday night for his suboxone prescription renewal. His test came out clean for opiates, dirty for THC. His doctor is only concerned about opiates. I tested B, the following day, and he came up clean. My concern is that B does not appear to be committed (enough) to working "the program". I think he's trying to do this on his own, though he's admitted-- each time he relapsed-- that he failed because he needs the program. He's running in circles with his sobriety. I also think that B has placed his personal self-worth with his net-worth. He feels he is a success, when he has money in his pocket. He can't manage money. He spends it before he makes it. Speaking from my own spiritual point of view-- my son, I pray, will learn to find that true joy and peace comes, from within ourselves, when we place Godly values before material values. The root of B's anxiety is one of more drama. How much do I believe is true? Please don't jump to conclusions... listen... and know that I know my son very well. He's my own flesh and blood. B's anxiety comes from money problems. B tells me that his second paycheck (from his new job) was stolen from him. His story goes like this-- he cashed his paycheck at his job (I wish they wouldn't do this) and he was walking to his friend's apartment, after work. Someone he knew from "back in the day" spotted him. I will call him "W". B says that "W" asked him for $5.00, so B took out his wallet and money (if this is true, not too bright) and "W" snatched it and ran. I asked him why he was carrying that much cash. He says he was going to pay back a loan to his friend, and then to bring the rest home. Do I buy this? I can't say yes or no. I see such poor judgment, if this is true. Why didn't you call the cops? I already knew his answer-- and I was right. Because I've seen "W" shoot someone in the leg for disrespecting him! I close my eyes (we're sitting in my car, in front of his work) and I exhale. This is the crazy world of drugs and the area where I live. There is a code of honor... (honor??? this is honor??) between gang members and criminals that I cannot fathom. B went on to say that is when he had to go to a cash advance place to borrow money. Oh. Did I mention this? B told me this on Thursday night (reluctantly), but could not explain to me why he borrowed money. He figured I'd assume he was buying drugs. I went with B to the place and the dates check out. Friday was his payment due date. He owed $150.00 plus $25.00 for the advance. I won't go into the long and drawn out conversation-- I'll cut to the chase. I had exactly $150.00, reserved, from a monthly restitution check that is mailed to our family from my son being the victim of a crime (yep, he's had his share of drama). I use this money for my son's needs. I do not give it to him as cash. I had prayed about this, and I decided to use this to pay back the loan to the cash advance place. I made my son do this, as I parked outside the door. My son was feeling to down on himself and discouraged. How I understand that! He has not listened to any of my advice on managing money. He has dug a financial hole for himself-- again. He was crying and upset and said he owed a LOT of money to people. I was thinking 4-figures worth of money. He handed me the list of debts and to whom. $20 here, $10.00 there. The grand total came to $270.00, including the cash advance place. I sighed with relief. I thought he was going to say $1000.00 or more. But, $270.00 is a lot to a 20 year kid, with the maturity of a teenager. He says he has to give gas money to his friends, for rides home and around. Why, B? I pack a lunch for you, when I make mine. I know, Mom...but I want to hang out with my friend (nice kid) and then I get hungry. Yeah, kids need a social life. He owes $58.00 to Hollywood Video. Why???!! I am screaming inside. "You keep paying those bandits because you forget to return videos?!" I told him how I used to be on my knees, alone, begging God to set me free of financial debt. I had to raise my son, keep my business going and to dig out of $56,000 in debt with no child support and no alimony. I do know the hopelessness and fear that comes with debt! Mine was on a much grander scale. Still, I can understand my son's anxiety. B sat quietly. He was listening? I also told him that it took me ten years to do become debt-free (and two jobs)-- with help from friends and my husband...but I paid them all back and I am now debt-free. B looked at me, incredulously. At that moment, I felt a connection. He looked at me and said "I'm out of the house. I smoked weed. I broke my promise". I looked at my son and asked him "where would you go? You have no money. No car." B, I said...look at me. "You are not in jail. You are not in withdrawals. You have a loving home and have a mom and step dad who want to help you stay clean and sober." "I am so ashamed, mom." "I know, Son. You feel like you are a failure in anything you do." "When times are tough, count your blessings...that's what I was starting to do." "Your blessings outweigh your sorrows." B took the rest of his paycheck from wallet. "Let's go pay bills, I said." I taxied my son to the stores to pay his debts. Then I dropped him off at his friends, where he went to a meeting. That gave me time to talk to my husband, and bring him up to speed. B came home 2 hours later, saying he was glad that he went to a meeting. My son is not using opiates, and that is what worries me the most. I honestly believe that my son needs help in understanding how to survive in this world. He has no practical life skills. His saving grace is that he is working full-time, he has given up his drug friends, he is taking a college class. He is respectful to me and his stepfather. He is helpful around the house. He is not stealing from us. That he smoked weed was his crutch-- albeit one that is not okay with me. I have made it very clear to him that our home as a ZERO drug tolerance. We are not throwing him out, but he must test completely clean. I am giving him one month, knowing that THC can linger. He cried with relief. No weed. No opiates. No illegal drugs. Period. Non-negotiable. His paychecks can no longer be cashed. Either his stepdad or I will take him to the bank to deposit them. Each week, he works with me on a financial worksheet I will design for him...and simple and user-friendly one. He logs on to his bank, and I see what's going on. I will show him how to list a debt-reduction and to make a plan to pay his friends back. I will not give him money to do it. I will show him how to save money for things he enjoys-- golf, new clothes. He will pay us rent, no exception. Period. The rent money is savings for when is ready to go out on his own-- one year, is what I am predicting. I will pay his first and last on a new place. He doesn't get that money in cash, or as a lump sum. He can't borrow against it. B is feeling discouraged. He says he feels as though he goes to work (it's demanding and physical work, standing and walking all day) and he has no money left to do something fun. Welcome to the world, son. I told him that he is like countless millions-- people who live paycheck to paycheck. At least he has a job. My son is very fragile. I think that what I really need to do is to set our boundaries, but to be encouraging to him. I don't want my son to feel that life isn't any fun. Isn't that what kind drive a person to use again? I need to step up to the plate, and make my calendar more available to get B to meetings. He doesn't have a car. He asked me to go to a Monday night meeting with him-- it's an NA "open" meeting. That's the night I really enjoy going to my swim exercise class-- I've missed it for four weeks due to illness, injuries or something to do with B. I'll miss it again. B is more important. As for my husband-- he knows everything. I told him. He amazes me. His point of view is the same as mine. He is willing to give B another chance-- ONLY because he sees B trying. He's pleased that B got a job and is going to school. He's going to talk to B today. One-on-one... man-to-man. C wants to tell my son how he feels, and that he is not going to tolerate drugs of ANY kind. Period. My son's heroin dealer... "T". He got arrested! The PD found four pounds of heroin, meth and lots of cash. Thank you, Jesus! I have prayed that God would expose the truth and bring T down to pay for his crimes. B came home, last night. He was gone for less than two hours. He said he went to a meeting, and he seemed "up". I didn't sense anything suspicious, as far as how he was looking or behaving. Then again, I'm no a mind reader nor an expert in addiction behavior. What I am is a mother who loves her son. That's in my wiring. Being the mother of an addict, becomes a double edged sword. This is where I feel a tug-of-war between my heartfelt love for him, and my hatred for drugs and cigarettes. I tossed and turned, throughout the night. It didn't help that I've been sick for a few days. Plus, I've been stressed at work. I have my own personal issues that I'm trying to deal with-- the way that God wants me to. Now, I'm feeling familiar instincts that my son is hiding something. Let's back up to B's return to home base, last night. B apologized to me for lying about something (I'm not ready to share this yet). He says he hates it when he feels that I can't trust me. Hmmmm, you're an addict. You've lied to me with a poker face. Why should I trust you? I explained to him that integrity is something that is priceless and it's something that I strive to maintain-- and a character trait that I hope people are speaking, in a positive way, about me. B said he didn't full understand what the definition of integrity meant. Simplified, I told him it means that someone can trust whatever promises or answers that come out of your mouth is spoke in sincerity and truth. It means that when someone with integrity (like my husband) tells me he's going to do something, I know it's going to happen. I told him, that our relationship isn't much different than a marriage that has had been damaged, because one partner has been unfaithful. He looked puzzled, and I explained about infidelity. I told him that it can take years-- if at all-- for the innocent party to feel they can trust someone who has been unfaithful. I don't think he fully graped it. B thinks that "I'm sorry" should wipe the slate clean and fill my trust account back to square one. This is not like apologizing for forgetting to give me a phone message.... or leaving a door unlocked. B doesn't seem to grasp that collateral damage that he's left me with, because of his drug addiction. He doesn't fully understand how many excuses and explanations he's given me, when I've suspected illegal activity with drugs. Later on, I would find out that I was right. He'd say "I'm sorry". Somehow, that isn't enough. His crying wolf is making it harder for me to believe what he says. For the last few weeks, I have seen all the positive improvements in my son. It gave me such hope. Yesterday, I had this overwhelming sense that my son is carrying dark secrets. Have I been in denial? When B returned home, last night, I went into his bedroom. I shut the door, and told him that I needed to review the terms of his living with us again. I told B that, while he was gone, I told my husband that B admitted he's been smoking weed. I told him that I suspect something isn't right, and I told him that B says he owes money to a cash advance place. I also showed my husband B's drug test, showing he was clean for opiates and dirty for THC. "C" said that he suspected that B was smoking weed. "C" is sick, like me, so I'm sure we have more to talk about, when he is feeling better. I reminded my son that we live in a drug free house. I told him that he was "out" if he tests positive for opiates. I reminded him, that he has three weeks to clear the THC from his drug tests. I also reminded him that if I find any kind of drug paraphernalia-- foil, straws or weed/hash, then he was out. B needs to realize that he's screwed if I throw him out. He has no car, no cellphone (he lost it), no money and his father doesn't live in the state anymore (and he won't take him in). He listened, and agreed. I also said that on Saturday, we were going to sit down and figure out what debts he has. All of them. He has to agree to no longer cash his paychecks where he works. Either "C" or I will take him to the bank. I get the paycheck stub and he has to account for where his money goes. He agreed. Let's go back to this morning-- B was not so agreeable. This is a huge red flag, with blinking lights and alarms, to me. B has deep dark secrets. So he became offensive with me. He interrupted me, and began to say things like "my dad says that you are like (fill in the blanks)... you always (fill in the blanks). I was in a relationship with a man, that lasted for about 2 years. I wish I could erase this chapter in my life. Suffice it to say that this man charmed me, via my son. He became that surrogate "male role model" at a time when B's father wasn't very involved in B's life. He was a man who paid attention to me, when I was starved for affection. It took a while for me to finally piece together that this man was an alcoholic and a drug addict. Naive me-- I couldn't figure out why cash came up missing from my wallet. Or why he was broke all the time. Or why I'd get this "icky" feeling about him...and I felt creeped out. His behavior was so different...almost like a stranger to me. Stupid me-- he was loaded. It took me a year to figure it all out. I'm going to stop dredging up those painful memories. My whole point is, that when this... person (choking back anger and pain) felt my coming closer to discovering his dirty little secrets, he would turn on me and say hurtful things to me-- things like I have an anger management problem, I'm crazy, it's my fault. In looking back, I now see that this is a familiar tactic that most addicts use. When the sober person (me, who is not an alcoholic nor drug addict...never have been) has exposed the addicts lies, they don't like it. They attack where it hurts. Sometimes, I was naive enough to fall for that trap and I'd defend myself. Now I know better... uh-uh, you're not going to take the spotlight off yourself by making ME the villain! No more! My anger management problem stemmed from knowing I was being lied to. This man, I later found out, had four ex-wives. I also found out that he had warrants out for his arrest. He was driving MY car on a California ID card, because his license was revoked. That's just the tip of the iceberg. He's out of my life, now. I'm trying to forgive him, because it's what the bible tells me to do. I struggle with closure on that relationship, because he never apologized to me or admitted what he'd done to me. He left me financially broke-- but guess what? I am now debt-free! That was a rabbit trail, I know. My point is, that my son underestimates my very sane and rational way of thinking that I acquired, after this chapter in my life. I'm not stupid. He is becoming, I think, a little too complacent in my love for him. I cannot bear that thought that I will have to throw my son out. I pray that will not happen. But, today, I'm feeling that my son needs to come clean with me. I offered to set him up with two pastors, that he knows-- two men who are youth pastors... wonderful pastors. I told B that if he had secrets to unload, and he wanted to talk to someone he can trust-- then I would arrange that for him. One more thing-- last night, I told my son how much I want him to come to church with us. He said he couldn't because he felt "ashamed" and "unworthy" of God's love. I reminded him that none of us are worthy of God's mercy. We are all sinners. I'm a liar, too. While I strive to be honest, I cannot say that I have never lied. I doubt anyone can make that claim. B admitted to me that he doesn't know how to pray to God-- how to ask God for forgiveness. He held out his hands and asked me to pray with him. I prayed that wonderful, healing prayer for forgiveness-- the one where we admit that we are sinners... where we thank God for sending his only begotten son...our Lord and Savior, Jesus, to die on the cross for our sins. I prayed that the blood of Jesus would wash us clean...and that B would tell God he wants to rededicate his heart to follow him. B repeated those lines after me. I'm weeping as I'm writing this paragraph. The last time that I led someone in this prayer, was with my mother-- while she was dying, in her bed. One week later, I watched her pass on to heaven. That prayer gives me comfort, that I know where my mother is. I pray that my son truly meant those words. Lord, I relinquish my worries and fears to you, Lord. NOTHING is impossible for you. This is in your hands. I pray that you will fill my son with the power of your Holy Spirit...that you will convict my son's heart to know that you love him....and that your perfect light will expose the darkness that is trying to overtake my son's soul. RIGHT BEFORE I WAS GOING TO HIT "PUBLISH NOW" the phone rang. It was "B". He sounds.... humbled? He asked if I could meet him for lunch. He wants to talk to me. I am feeling nauseous and a heavy weight on my heart. I cannot get into details, at this time. Suffice it to say that my son is showing suspicious behavior. I asked him for a test, on the spot-- in my bathroom. Pockets "out" in his pants. I listened to him pee, checked the warmth of the urine. He's clean for opiates. Dirty, still for THC. It's been too long, for the THC to still test dirty. B is crying. He says a friend told him that he (the friend) has six months to live. Cancer. 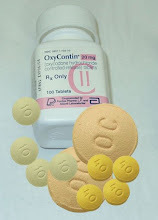 B already lost one friend to suicide (November) and another friend to an overdose on Oxy-contin (in the summer). B has been avoiding me an accounting for where his money is going. He got his third paycheck yesterday. I really questioned his accounting, when I picked him up from work. He got off 1/2 hour earlier than he said and he wasn't there. His eyes looked weird-- hence, the drug test. B has financial problems, and he says owes money. He says he can't tell me everything. It's amazing, the strength I've gained during the last year. Rather than flying off the handle, I feel as though a sense of peace hits me at times like this. I feel as though I need to stay calm, and to keep my voice calm and soothing. My son is as sick as the secrets he keeps. Addiction is a dirty business. Addicts lie so easily. My son is still at Step #1. His addiction has made his life unmanageable. My son, cannot manage money-- sober or not. B just left, with a friend from the program, to go to a meeting. I'm worried, and I know that's fruitless. I don't know if he's really gone to the meeting. What I do know, is that I have allowed my own self to become complacent in believing my son is out of the woods. Tonight, I am reminded that my son has a serious addiction to smoking heroin. Nine weeks of sobriety is very fragile. Because B cannot drive (no car insurance) I should make it a point to get him to meetings. We live in the country, so buses are not an option. B works hard, in his new job. So, he goes to sleep early. However, tonight he admitted to me that he's been smoking weed. I thought so, all along. I've heard all the arguments-- that "weed" should be legalized; that weed is a "gateway drug". To me, it's illegal. Obviously, B isn't working the program-- to it's fullest-- if he is smoking weed. He says that quitting smoking is too hard, and he needs something to help with his cravings to "use". I'm feel very anxious, at this time. I've already had my quiet prayer time. I've stopped asking God to "fix" my son. What I ask God is to reveal the truth, and to give me the wisdom and strength to know what to do. I am not going to throw B out for smoking weed. I went through his room, and didn't find anything. However, B and I need to have a "come to Jesus" talk on Saturday morning. I'm home, sick, from work. I doubt I'll be well enough to return by tomorrow. I need rest. I am waiting for B to come home-- within an hour. I am going to test him again, tomorrow. Just in case. B and I are going to revisit his terms for living here. I've made it very clear that if he tests positive for opiates, he's gone. I need to reiterate, that if he tests positive for any kind of illegal drugs, he's out. That includes weed. As far as money goes-- until he pays me rent, he needs to account to me where his money is going. He's borrowing from cash advance places, and that's not a good sign at all. Is B using? Dear God in Heaven, I pray that he isn't. I'm worried, sick, that I will have to keep my promise to my husband. I do not want to kick my son out of our home, and life. I hate drugs. I hate cigarettes. I hate lies. My son thought I wasn't seeing through his explanation for why he has no money. I had my suspicions. Mom isn't stupid-- especially when it comes to numbers. I owned a business for 15+ years, and I know how to read a Profit & Loss statement. I have a very fast head for numbers. Something is not adding up. I pray that his money isn't going for drugs. Oh, how I'm praying that my son is not going to use. He seemed so fragile when he left. I told him, that I was ready to hear the truth. If he owes money for ... I don't know what... then he needs to be honest with me. I won't give him money to get out of his predicament. But, I will help him to manage his money for a while. B said that he was going to come clean with his sponsor, tonight. He says he will come clean with me later on. Dear Father in Heaven-- I pray that you are preparing my son's heart to confess his transgressions to you. Please, help my son to tell me what I need to know. Please, help me to know what I should and should not say to him. I pray that he is not using opiates. Oh, how I pray that he isn't. His life is too precious to throw it away like this. Please, God, let him know how much he is loved. B just came home. Will "blog" more, later. I haven't been posting much, lately. I think about it, everyday, but my job keeps me from being able to sit down and compose what I want to say. I have a lot of things to say, in my head. Now, here I sit, feeling...blank. I'm just going to jump in and see where my fingers end up on the keyboard. My son is coming in to six weeks of sobriety. For those of you who are new to my blog-- I am coming up on my one year anniversary of starting this blog-- April 1st. So much has happened-- April 2008, my son finally admitted that he was addicted to smoking heroin and agreed to check in for detox and treatment. He lived one SLE and then had four different roomates in an 8 month period. All three times, the living arrangements (except for the SLE) didn't work out. The first roommate turned out to be a raging drunk, and my son feared for his life. The second roommmate turned out to be a good friend to B (he was old enough to be his dad), but he eventually started drinking again. That led to the roommate eventually flipping out at my son, and literally throwing him out. Two months later, B's roommate's body was found in the apartment. He had shot himself in the head. The third roommate didn't mention to my son-- until AFTER he moved in-- that he was a convicted child molester (he had molested his own daughter). My son hardly slept there at all-- turns out B was driving 2 hours south (to where I live) to buy drugs. I didn't know he had relapsed. B's father let our son live with him, though he was renting a room from the child molester. Then, in October, my son admitted that he was doing drugs again and off to rehab he went. A woman (old enough to be his mother) offered him a room to rent in the San Francisco area. I wasn't wild about it, but I wasn't going to let my son come home. It was a disaster, I later found out. "S" immediately relapsed into drinking and then started doing heroin with my son. I knew something wasn't right, but I knew I was powerless to make a difference. My son got robbed and lots of other craziness that comes with addiction. I used to dread the phone calls in the middle of the night. Finally, at Christmas, my son came home. Money had run out, and he promised he was clean...yadda, yadda, yadda. Long story short, the truth came out around February that B had been using again. Stupid me, I didn't drug test, because he seemed to be doing just fine. So, new readers-- there you have it-- a review on just a few things that have happened in the course of almost one year. Today, I feel as though my son's addiction has become "manageable". I say this with great caution. I am random testing my son, now that I know better. B has a full-time job. He has given up all of his friends, save for one, who seems to be "safe". B hangs out at home, when he's not working-- unless he's with his sponsor and going to meetings. He's respectful, helpful and we have grown close again. He seems to feel he has a purpose in life. He's still lazy, but that's me. I guess I'm a go-getter, and I have to watch that I don't impose my own expectations on him. He's a kid, whose maturity has been stunted by six years of drug use. I feel like I have my son back again-- the boy that I gave birth to, and a child I desperately wanted. The other night, I was watching my son, sprawled out on one of our couches with his long legs (he's 6'3). He was reading a book, and I was quietly surfing the net on my laptop. It hit me... a feeling of pure love flowed right through me! It felt like God was filling every part of my body with his presence. I realized how much I loved my son! I am sharing this, because my heart aches for other parents whose blogs I am following. Recently, I read some pretty heartless comments from someone, who was attacking the mom for seeming "cold" and "indifferent" towards her addict child. Wow. Been there, done that. I've had some pretty cold comments sent to me. People cannot understand what it's like to be the parent of an addict, unless you are one. You just can't understand. I used to defend myself, to the commentors. But, now, I realize...they just don't know me. I no longer blame the parents if their child uses drugs. Trust me, when I say that I was there for my son . I gave up working longer hours (and I was broke) so that I never missed a baseball practice. Sure, I lost it, during the times my son was an obnoxious middle schooler. I made mistakes, and I've apologized to my son. It's is not my fault that my son is a drug addict. I also learned that your child can be a functioning drug addict. I never knew what oxycontin was. I never knew you could smoke heroin. I never imagined that my son was deep into the world of drugs and dealing them to stay alive. I never saw it coming. I missed a lot of signs, and I still wonder if my son is "loaded" when he looks tired or acts a little to energetic. Yes, I have some residual paranoia...and I might, for a long time. I've also learned that there is no cure for addiction. I was reading my earlier entries, where I refer to my son "getting better". Ha! Drug addiction is not an illness. There is no cure. I have learned what it really means to live life one day at a time. How is my son? My answer is, today is a good day. I have also learned that an addict cannot begin to find sobriety unless they are ready to. Addicts must want to become sober for themselves. My son says that he did it, the first two times, for us. This time, my son says he is tired of the emptiness his life of addiction left him with. He says that he sold everything he ever owned, to buy his next fix. His flat screen TV, guitar, electronic games, laptop, clothes....anything he could pawn for money. At least my son never stole. The moral values I tried to instill in him, seem to stick in that department. Praise God. I received a comment from an addict-- she said that my blog gives her hope. Thank you. I pray that is what I am doing. BUT... I told my son that you cannot tell your mother that you are using again. I encourage you to tell her. But my son said something to me, he wants to tell you. He says that if you can't afford suboxone, then you can't afford to use. He says that instead of buying your drugs, buy suboxone. Do I agree with that? The whole thing breaks my heart. I feel for addicts who cannot find a way to get professional treatment. But, I see my son's point. Suboxone, for him, is keeping him sober. B has a long road ahead. I know that he could start using again, at any time. The devil is nipping at his heels and I pray, every day, that God will give my son the strength he needs to resist the temptation. I am faithfully praying for families of addicts. Though my son's addiction seems to be in a calm stage, I know that I could be blogging like so many other people-- there just might come a day when I would have to throw my son out of my house. I cannot imagine how painful that must be. I pray for parents who have been depleted of patience with their addicts who have robbed them blind...lied to them and have caused the financial strain. I do not judge any of you! I feel for you. I thank God, that today is a good day. **UPDATE: My son tested for me, after I posted this. He's clean for opiates, Praise God! The THC is still positive. I let my son read a blog entry from an addict who is trying to detox on his own. My son desperately wants to write to him. B seemed deeply touched. Sometimes, when I let him read the pain that others blog about, he sees the other side-- how loved ones are affected. This entire week has been really hectic for all three of us-- my husband, my son and myself. My husband is adjusting to his new job. I'm still dealing with some health issues (girl stuff) and I need to have outpatient surgery on Monday. So, I've been busy with doctor pre-op appointments, lab work and feeling tired and stressed out. My son is beginning to get a taste of what it's like to work full-time. His job starts at 7:30am and ends at 3:30pm. He seems very excited about his job, and he likes to talk about his day. That makes me very happy. Being on your feet as a grocery bagger is hard work. I had a part-time job, working at Macy's, while working another full-time job. Retail work is hell on your back, legs and feet. I remember that feeling of wanting to crawl through my front door, after standing for 4 hours on a carpet covered concrete floor. My son is definitely working very hard, physically. He's been going to meetings with his sponsor a couple times a week. The other nights, he's home right after work. He eats dinner with us, we chat and he goes to bed. I finally feel as though my son is becoming a young man. He's still an addict, though. I haven't forgotten that. In fact, when he wakes up, I'm going to hand him a cup and test him. I don't tell him, in advance. Last week, I was praying to God that he would send someone into my son's life who is a Christian. For those of you non-Christian's who are reading my blog, please know that I strive to be a non-judgmental Christian. By that, I mean that I don't think I'm better than someone who does not believe in Jesus. I'll pray for you, because I believe with all of my heart, that the Lord changed my life-- 12 years ago-- after 20 years of turning my back on God. I once hated religion, and believed I was not worthy of God's love or forgiveness. I am very open about my love of Jesus. That's a very brave stand to take in today's world. Sometimes, I feel that God's Word (that would be the Bible... a book that I find so much strength and wisdom from) is under attack. I feel as though today's World is trying to rewrite God's word. I can't understand that. I am trying to live my life according to God's will. For the record, I blow it every single day. So, there you have it. I love God, I believe in the Bible and I am a sinner. My point is-- my son is a "believer". I never shoved "religion" down his throat. B attended youth groups since Middle School. He has a heart for God, and my son has a good heart. He's not an "evil" person. He has a good conscience. But, like so many Christians (and this includes me), my son is living in "The World". He is not putting God, first, in his life. The 12-Steps focuses on a Higher Power. Sometimes, my son thinks he can fix his addiction by himself. He can't. He needs to surrender to God. I've been praying that my son would get out of bed on Sunday morning and go to church. It's the church that B led me to, by the way! It's a wonderful church-- it's a Contemporary Church, with wonderful music and a Pastor who isn't boring in any way. It's a church that offers groups for young adults-- I am a volunteer with the high school kids, and I love it. I want to be a Prayer Warrior. Every morning, as I am commuting to work, I have quiet and uninterrupted time to talk to God. I always pray for my son, his friends who are addicts and the families and addicts I have met in Blogosphere. On Wednesday, I remember asking God to making his presence know to my son. God answers prayers, at times, in such a way that you cannot doubt He has answered it. I had to do lab work (as I mentioned earlier in this post). I arrived about 20 minutes before the lab closed, so I was the last patient. There was a lovely young woman, with a sweet smile. She looked at me and asked if I was a friend of "Bill". "Bill"?, I repeated, looking puzzled. Still looking perplexed, I said "no". When I returned to the room, I told her that I realized what she meant. I told her that my son was in the program. Then she said that she met me at the Women's Retreat with our church two years ago. My mental rolodex was spinning and then I remembered....she was new to our church, and she was in my small group. I had the most delightful conversation with "J". It turns out that she has been clean for seven years-- alcohol and opiates. I listened to her, and it could have been my own son. She validated so many things that my son has said to me about addiction. It made my eyes fill with tears. I wanted to hug her. J is my answer to my prayer. She lives in our area. Her fiance' ha 19 years of sobriety. She gave me her phone number and my son would like to meet her for coffee. She even attends the same meetings that my son likes to attend. Is this the Christian addict that I asked God to send into my life? Praise God! As I am writing this, tears are coming again. I have so much more to blog about, but I need to get moving. I can't blog as much, during the week, because of my job. I'll try to catch up on other blogs that I am subscribing to. I am following two of them very closely, and my heart is aching for the pain that they are going through. I received an email from an addict who is facing the beginning of withdrawals and detoxing on his own. "G", I am praying for you. You were the last person on my mind, last night. Today, I am feeling tired but very hopeful. Of course, I feel anxious right before I'm going to test my son. I have that fear that my son will test dirty. I cannot imagine what it's like to follow through on throwing your own child out of your home and life-- because they have lied about their sobriety. I hope I never have to test my strength. My son must be drinking up Saturday morning sleep-ins. At least he's not trying to sleep off his "high". He's a much different person-- clean and showered, nicely dressed, cheerful and he's trying very hard. It's windy and rainy in California, today, and I am loving it. We need it, desperately. It's the kind of weather where I just want to go home, make a pot of soup, light a fire (with a presto log) and appreciate my home. I'm feeling at peace, and filled with a lot of hope. There are a lot of reasons why-- but a large part of this is that B got a job! In this economy, with unemployment rates in the double digits, B got a job on his own. Praise God! He'll be a grocery bagger, 33 hours per week, at a mom & pop grocery store that I've shopped at since he was kicking inside my belly. He started this morning, and will work Monday through Friday from 7:30am - 3:30. This is SO annointed by God! His car insurance runs out next Sunday, and I was not sure how my son would handle that. His work hours match mine and his step dad's, so we can easily drop him off and pick him up. He can drop down from 12 units of school to 3. He would be overwhelmed with balance full-time work and full-time school. He will split the cost difference on his health insurance, because he is no longer a full time student-- he understands how important it is for him to have his COBRA plan because he's an insulin dependent diabetic and he's an addict, who uses suboxone. He has agreed that I get to see his paycheck stubs. He will pay us rent (trust me, it won't be a LOT of money)-- but that money will be set aside as a savings for him. When he's ready to move out on his own, that money will pay his first, last and deposit. It will not be handed to him in one lump sum. I'm not that stupid! I also explained to him that the rest of his money needs to be kept track of-- I'll teach him how to download his banking into Quicken, or I will show him a very simple way to track his money by hand. Yes, I'm good at bookkeeping. These are lifeskills that I'm thankful my mother taught to me. I hope that B will be receptive to these. Last, I told him that if I see him spending his money on frivolous things-- like video games and gadgets, I would not be happy about it. Now, this might sound controlling. My point is, that if we are providing for his shelter, food, medical expenses and miscellaneous things-- I would be resentful if he blew his money. Saving money to buy something is good, and I encourage that. But, he needs to learn how to take care of the non-negotiable costs of life. B completely agreed with me. That's a good start. I'm hoping that his having a job will give B a sense of structure and a chance to learn how to work in the real world. I would be thrilled to see my son become a responsible and dependable employee. He can still add on more college classes, but I think that it was the wisest decision for him to take a job, while it was available. I'm feeling that B and I have grown closer than we've ever been. I'm learning to stop my business and to take the time to sit and talk to B. I'm learning to LISTEN to my son. We haven't argued since I blogged about wanting to stop play tug-of-war. B has been sticking around, at home, a lot. He's home early, and he checks in with me. He's still testing clean, with my random checks. By the way, I am fully aware that addicts are very clever at cheating at drug tests. The best that I can do is to insist that he uses our bathroom, that has a toilet room and no places to hide things (like fake pee). He wears boxers and I can hear him going (no, I don't watch him)! The cup is warm when he sets it on the bathroom counter, and it has a temperature strip on it. If he's faking it, then he's very clever. I just feel it, in my heart, that he's not cheating. I've been bamboozled by him many times. This time, I truly think that B doesn't want to use. Of course, my sense of joy and hope still has that sense of doubt-- knowing that opiate addiction is very difficult to conquer. My son has relapsed three times in one year. I have not forgotten that tomorrow, next week, month or year, my son might not be able to resist the desire to use-- especially is something traumatizes him. My lunch break is almost over, and I wanted to blog about other blogs. I admit, that I've been avoiding reading many blogs on addiction, that I am following. I confess, that I've been losing myself into my own food blog. Cooking is my hobby, passion and therapy. Now, photography has become something I'm learning, as well as HTML codes and how to build a better blog. My son loves the fact that I have a food blog. It's kind of cute how he reads what I write, to see if I mention him. It made me realize how insecure he is, and how much he really needs to feel loved and to hear positive things about him. I need to make sure that I do that. I will try to build a list of blogs I've been reading that have deeply touched my heart. One of them is "Subdural Flow" at http://brokenheartedmom.blogspot.com/. Today is the first day I've had the time and mental energy to read her blog and it is brilliantly written, very touching and I'm totally sucked in to her story. If you have not checked out her blog, please do so. I am still learning about Blog Awards, and hoping to learn how to create my own. If I could, I'd give every single one of my blogs on my blogroll list one of my own. Now, all I need to do is learn how to split my two blogs into two separate ID's. I was so new into the world of Blogging, that I did not realize I should have done that in the first place. So, if you've clicked on my ID, and you end up on a Food Blog...well, I need to change that. I really want to stay anonymous... though, I'm very open about my son's addiction and my son knows that I have a blog. Gotta go...lunch time is over. I have no time to edit, proof read or spell check. Maybe later, so forgive me.